Do you have certain food that you love, but refuse to make at home? For me, this used to be sushi. I love getting sushi out and it’s a major treat for me when we go to Japanese restaurants. Since I love sushi so much, I attempted to make it at home one time using a cheap kit I bought at Wal-Mart. At the end, I was left was such a bad mess I refused to ever try making sushi at home again. Since I love to cook, this was very depressing for me. Recently, I discovered a product that made me consider ending my sushi making boycott – the SushiQuik. Love sushi but find it too difficult to make at home? Well, you will never have to buy sushi out again with the SushiQuik! 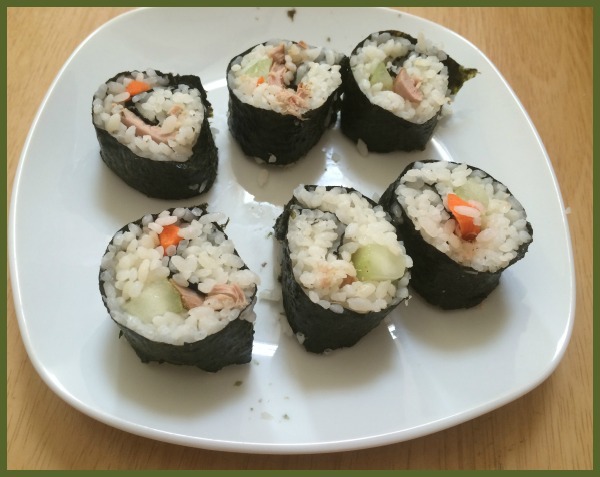 Prior to the SushiQuik, making sushi at home wasn’t easy and took quite a bit of practice. This made it difficult for the everyday person to make beautiful looking sushi at home. With this kit, anyone can make sushi at home, making it great for parties or as a fun way to make dinner as a family. To see how the SushiQuik works, make sure to watch the video below! Prior to the SushiQuik, I avoided making sushi. As I said, I had tried once before and it was a huge disaster. My kitchen was covered in rice and I eventually threw the entire thing away, upset because I wasted food and had a giant mess that took both of us forever to clean up. Having been traumatized by my first experience, I was hopeful but nervous about using the SushiQuik. While my first attempt was a bit ugly – I missed an important step in the directions – my second looked absolutely amazing! I had beautiful sushi rolls with tuna, carrots, and cucumber in about ten minutes. This kit really made rolling sushi trivial, which is a major plus to me! The only hard part of making sushi with the SushiQuik is teaching yourself how to cut the sushi properly. Once you have mastered this part, you are ready to make just about any sushi you can imagine – really, the sky is the limit! Based on my own experience with the SushiQuik, I am happy to give this product an A+ rating! Want to learn how to make sushi in your own home? You can purchase the SushiQuik for $35 on Amazon.com. 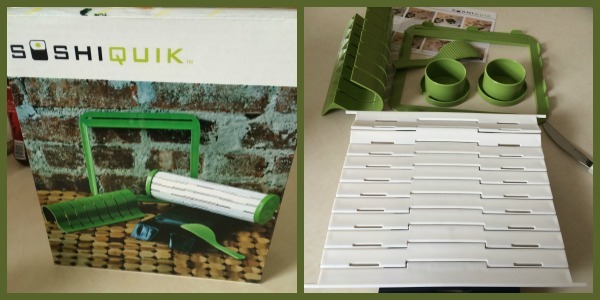 Once you have used this kit, you will never buy sushi out again! Would you like to win one of these awesome sushi makers for yourself? We are excited to be working with SushiQuik on this awesome giveaway! 1 of our lucky readers will win this awesome kit. To learn more, make sure to read the rules below and then enter through the Rafflecopter. 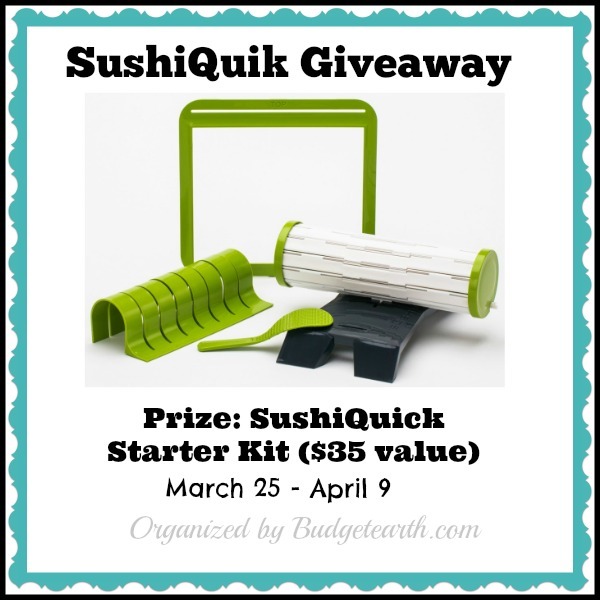 One lucky reader will win a SushiQuik Starter Kit ($35 value). Sweepstakes ends April 9th at 11:59pm ET. I love sushi i could eat them all day long. I would really like to win this because my family loves sushi. We go out for it from time to tine but I’d like to make it for my husband. I am a big sushi fan. This is the perfect little kit to help make my favorites right at home. We love sushi in our house..especially my 7 year old daughter. It is expensive to eat out or even get it at the grocery store. This would be so much fun to try. Thanks for the opportunity! I’d love to win this because I LOVE sushi! I could eat it three times a day with no problem at all. It’s just SO expensive, I eat it when I really need to treat myself. If I won this, I could roll my own. Toro, tamago, futomaki – bring it on! Oh boy! First let me say I love sushi, I bought a mat a while ago but haven’t used it yet this one might be perfect. Hope I win it good luck to all. i have not yet tried to make sushi but it looks like this item would help. plus, it’s expensive to eat sushi out. I would love to win this as I love sushi; although I don’t have it as much as I would like. Knowing that I could make my own sushi at home would be more cost effective and healthier are also great benefits. I would love to win a SushiQuik because I love sushi! This would make making it so convenient! It really is very neat. I love sushi so much and I love being able to make my own. I would like to win this for my nephew’s wife. I just found out they love sushi and he’s being deployed to Kuwait she needs things to keep her busy while he’s away for 9 months. I’ll bet she’d like to be good at this when he returns! I love sushi but have have never been brave enough to try it at home. With this kit I think I can make myself be brave and give it a try. My wife loves sushi and could eat it every day. Would be fun to try making at home. I have never ate suhi.But I told hubby that I would try it. He likes it really well. I’ve never tried sushi. My daughter has always wanted me to try it and maybe if I can win this, I will. My boyfriend and I are absolutely obsessed with sushi! We’ve tried several different kits for sushi and very few worked the way we wanted them too. This kit would definitely be put to work in our household! I would love to give this to a dear friend of mine. He’s always making sushi. I’d like to win it so that I could try more sushi. I’ve been keen to try more since my first taste, but I can’t really afford good quality prepared sushi. This would let me by the ingredients (not really that expensive) and make my own. My husband and I both LOVE sushi and just the other day when eating it out, my husband asked me why couldn’t we just make our own at home?!? I told him I would look into a sushi making kit…and look at what pops up…this awesome giveaway opportunity! Thank you so much, and for the review and information too! I LOVE sushi but it is sooo expensive when we go out esp for the both of us. I would LOVE to try and make it at home…it would be fun for us to do as a family. My husband and I love sushi but it can be so expensive to go out to a sushi restuarant and the ones that are cheaper usually arent trustworthy. I would love to try to make my own sushi! Oh my son and daughter both love sushi, every time they come home to visit I take them out for sushi. I would love to win this and actually make it at home for them! I love sushi (and am looking forward to little one arriving so I can enjoy some!). We have a sushi making kit at home but it isn’t very useful and, as you mentioned, just resulted in a big mess. This looks much more manageable! I would like this because I grew up eating sushi. I never learned how to make it thoguh so this would help! I LOVE sushi and sashimi. If I had this kit, I might invest in a piece of sashimi grade tuna and make a spicy tuna roll. I’d love to win because I’m a college girl that loves sushi and other japanese foods but it gets expensive, this would save me lots of money. I would love to win because my daughter loves sushi and this would save a ton of money. Love this! Id love to win one of these because we love sushi. I have tried to make it myself and was succesful, but the sushiQuick would make it that much easier. Hope to win! Thank You! My hubby loves sushi! This product looks amazing! I’d love to get this to surprise him for his 50th birthday!! I would love to win because my Uncle and sister really love sushi! They would be so happy if I won this. I’ve tried making sushi in my house but I cannot get the hang of it. Therefore anything that would make it easier would be a huge help for my sushi-making. We love sushi and the fact it’s lo-cal. The nearest restaurant is almost 50 miles. I love sushi but the closest decent place is 45 minutes away. I’d love to be able to at least make some basic veggie or California rolls at home. We love sushi at our house! Well at least two of us do. It does add up going a couple times a month. But being able to make it at home would be amazing. I love sushi. I had it for the 1st time 6 years ago and have been hooked ever since. I would love to win a SushiQuik so that I can make all the Sushi want. Sushi can be expensive so being able to make it home would save me money. Also I can make whatever flavor I want. Our Wegmans never has any Sushi with Eel in it! I’ve always wanted to make sushi and I hope that you will give me the chance to learn make my own at home with your giveaway. Thanks. I have had sushi, and can’t say it was my favorite thing. BUT, my son and daughter-in-lsw eat lots of sushi, and have actually tried to make their own, without a lot of success. This surely looks like it would simplify the process. I would love a SushiQuik because my husband and I love sushi and this would make it so much easier to enjoy it! I have gone to all you can eat sushi and have had 96 pieces of sushi. It’s one of my favorites.